EasyDose makes the compilation of completing this onerous task very simple. At the click of a few buttons, the report can be compiled, edited, printed or emailed direct to the Health Department. Pharmacists who have many CPOP patients can spend up to a day compiling manual reports, especially if they have 50 patients. The report is compiled by selecting Health Department Monthly Return from the Reports menu. If manual adjustment is required for the number of missed doses and takeaways, the calculated value can be overwritten. 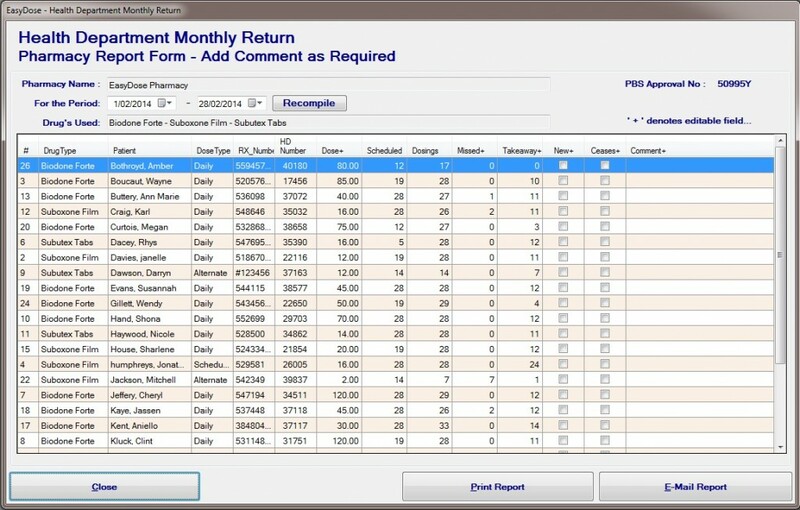 Comments can be added to each entry while tick boxes can be changed in value to indicate if the patient has ceased dosing or they are a new patient. When a NEW patient starts dosing or and patient CEASED dosing, the appropriate tick box must be selected by the end user. The system CANNOT determine if there patient is new or ceased dosing without user intervention. All columns headed with an “*” can be edited. The report can be printed from the print report button. 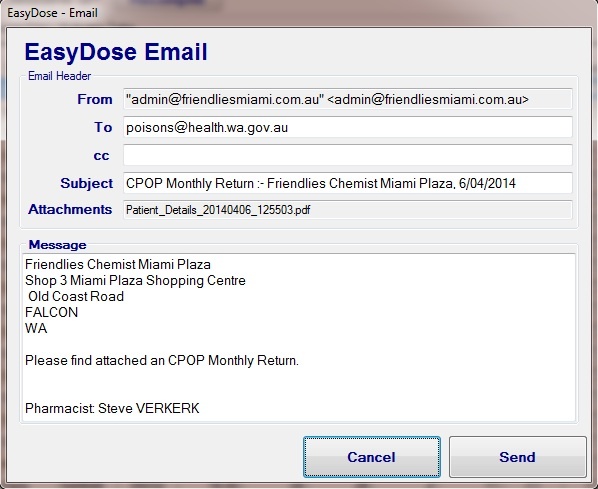 The report can be emailed direct from within EasyDose even if you do not have an email editor on the computer where EasyDose is installed. 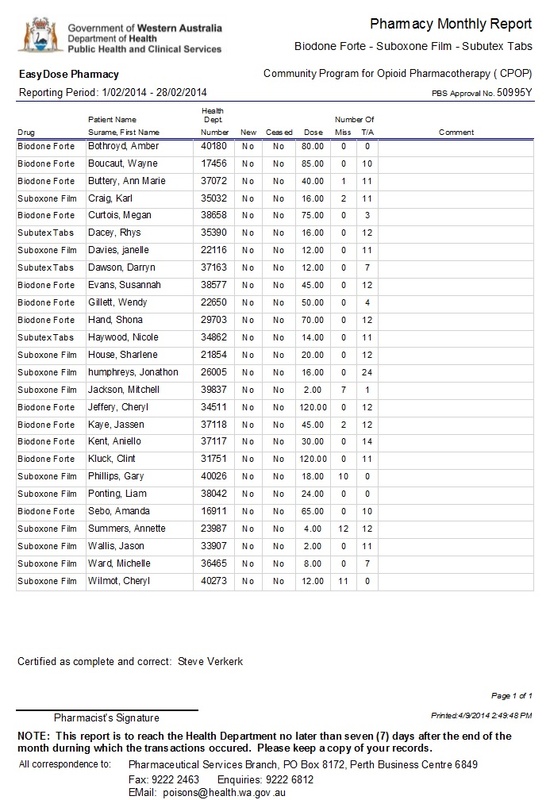 This report can in no way cater for all scenarios during a given period and compiles data from know information contained within tables holding data for each client. In perfect world, where a patient starts dosing from the 1st day of the month to the last and does not change their dosing schedule part way through the month, the report will accurately show the last Dose (Volume) and correctly calculate the Missed Doses and Takeaway Doses. A Patient Starts or finishes doseing part way through the month. The patient, on prescription, changes their dosing drug part way through the month. In these circumstances, the report form will more than likely indicate an incorrect number missed doses. There are various reasons for that which simply cannot be catered for through programming alone. To overcome these circumstances, the Report Form has been designed to allow the operator to manually adjusted the Dose volume, the number of Missed Doses and the Number of Takeaway Doses. (Columns with a ‘+’ allow manual entry). Other columns such as ‘New’, ‘Ceased’ and ‘Comment’ can also be manually adjusted. This will allow for accuracy to be maintained within the report.